emotanafricana, Washington, D.C., January 09, 2012. 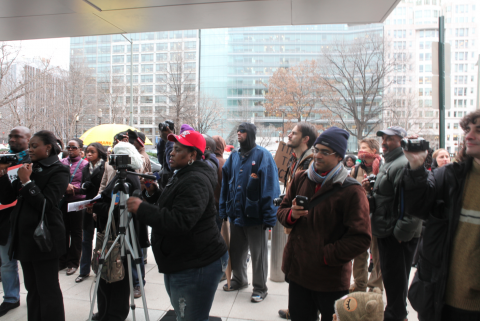 Ms. Emira Woods of the Institute for Policy Studies in Washington, D.C. led a solidarity protest with OccupyNigeria today at the World Bank Headquarters in D.C. Supported by Sahara Reporters, Justice in Nigeria Now, Africa Faith and Justice Network Jubilee USA, Africa Action, Action Aid and OccupyNigeria Movement in Washington, D.C., the rally was a coming together for many Nigerians of different ethnic groups. There were songs in Ibo, Yoruba and English exhorting President Jonathan to “end corruption, not subsidy”, songs of solidarity, “solidarity for ever” with sprinklings of messages for those who have continued to ruin Nigeria AND the National Anthem was sung at the beginning and end of the protest at which World Bank Security as well as D.C. Police stood watch. The rally – as has become the practice since the Occupy Movement started in the States – Occupy Wall Street, OccupyDC, etcetera, African-Americans, whites and other protesters from the OccupyDC Movement at nearby McPherson Square joined the rally. An American of Indian ancestry was among the speakers. The Occupy Movement has become a sort of rallying voice for various causes that seem to bring to the fore the plight of the neglected majority (the so-called 99% because of a finding that 1% of U.S. population owns around 70% of the wealth). Late last year, the Occupy Movement in some states moved to houses that were to be foreclosed as reported here earlier in attempts to prevent prospective bargain hunters from being able to buy foreclosed homes. Also represented at the rally – reflecting a spirit of – down-trodden of the world, unite – was a representative of the 11-million member-strong AFLCIO labor union who read a message of solidarity with Nigerian labor unions to great applause. There were speeches by Ms. Woods, Sahara Reporters’ Sowore and many others touching not only the subsidy removal but big oil, despoliation of the Delta area through oil spills, corruption in Nigeria and the destruction of people’s lives in Nigeria, Greece, and wherever the Bank and the IMF ply their deadly trade. Ms. Okonjo-Iweala, Nigeria’s Economy Czarina got several mentions in songs and speeches as being due for recall to the World Bank as she is seen by most Nigerians as non-patriot who represents the interest of the World Bank while the Fund’s Ms. Lafarge was pointed out as the person sent to Nigeria, Ghana, etcetera, to order the governments to remove subsidies. A speaker wondered how a policy that was to take effect from April 1 suddenly was fast-forwarded to January 1. He – like all speakers – saw the unprecedented more-than-100% increment as the handiwork of the commissioned agents acting on behalf of Western interests. There were Nigerians not just from the D.C. area but from New York, Los Angeles and some holidaying Nigerians visiting the States. Among the protesters were Nigerian professionals, including Ikhide R. Ikheloa, the author of the crisp, tight and interesting weekly “email from America” in the suspended 234NEXT and Aniedi Okure of Africa Faith and Justice Network. On Friday, the protest moves to the Monetary Fund which is separated from The Bank’s humongous building by a road. Protests are also planned for New York (The Nigerian Consulate) and other cities. ← (Oil Subsidy Removal)/Wole Soyinka: Back to the Trenches, Predictably!